There are seldom any complaints when a restaurant pulls all the stops at their premier bash, and such was the case with the recent pre-opening party at Kings Row gastropub in Pasadena, California. The million-dollar question on my mind was this: could they keep the vibe going with exceptional cuisine in a comfortable and loose atmosphere on your average night. If my experience a week after opening is any indication, Kings Row delivers the goods. In order to get a fuller appreciation of the Kings' supper, I joined Claudia and friend Eddie Lin for a taste of the regular menu, starting with their signature cocktails. I couldn't help being fascinated by the Ginger beer, an odd mix of the once lowly, now trendy Pabst Blue Ribbon and Domaine de Canton ginger liqueur - the melding of both muted each other so there was still the heady beer aroma with a sweet ginger taste. We opened with three opening selections, starting with Kings Row's take on the immortal British side dish, bubble and squeak. This concoction was bubble and squeak in name only; I wasn't in the kitchen to hear it babble and bubble while being cooked, but I suppose you had to name it something. 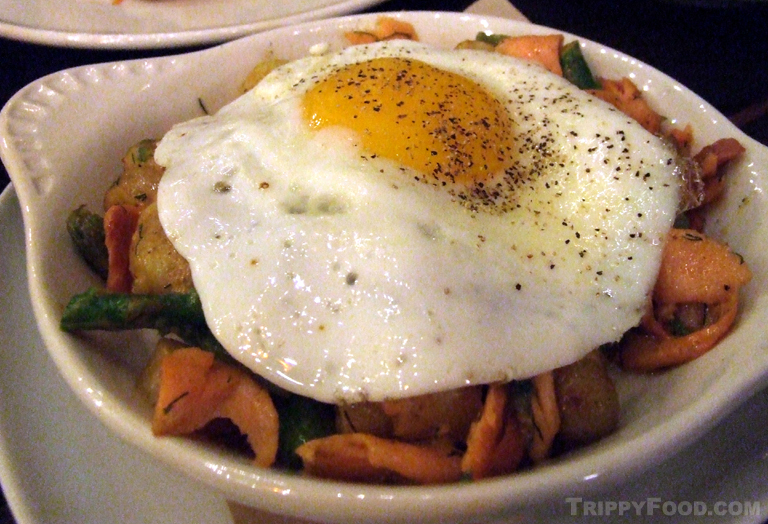 Chef Jesse cooked down young potatoes and chunks of asparagus and then liberally added in tiny bits of smoked salmon - the whole pile was gloriously topped with a fried egg, whose fork-released lifeblood permeated the dish and brought it to life. The unique and strong tastes of the salmon and asparagus worked wonderfully together and I was ready to order another bowl before coming to my senses and realizing I had bigger fish to fry. The barbacoa tacos were tasty, with the sweet, melty meat accompanied by a zesty avocado salsa and grilled jalapenos, but as light and crispy as the fried tortilla shells were, soft tortillas may have brought out more of the flavor. Their duck banh mi was more traditional that some I've had in Vietnamese fusion restaurants with crunchy greens and a jalapeno/carrot mix that gave a nod to curtido, and the sandwich won over Claudia, who is not much of a fan of duck. 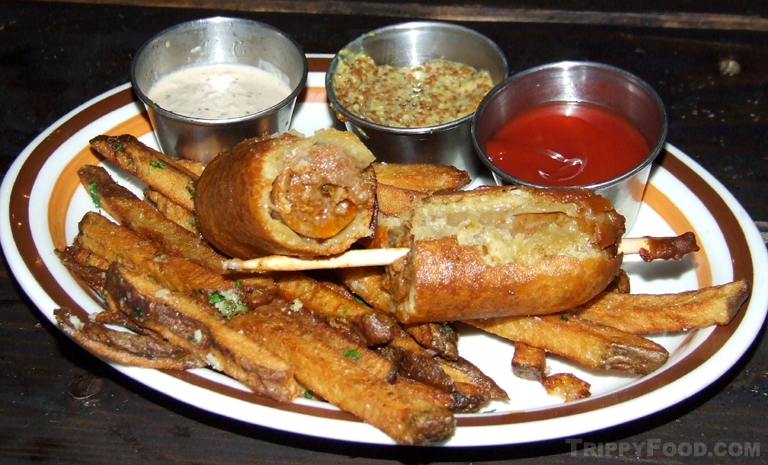 We had seen the trippy Merguez corndog on the chalked menu outside and put it on our "must have" list. The spicy sausage wrapped in a layer of root beer infused batter was like a trip to the fair in one sitting. The corndog was accompanied by three dips, and although the spicy mustard added a different dimension to the skewered meat, it was flavorful enough to be enjoyable naked. Choosing an entree was difficult; the menu turns pub fare on its head and reflects innovation and variety, pushing the culinary envelope. 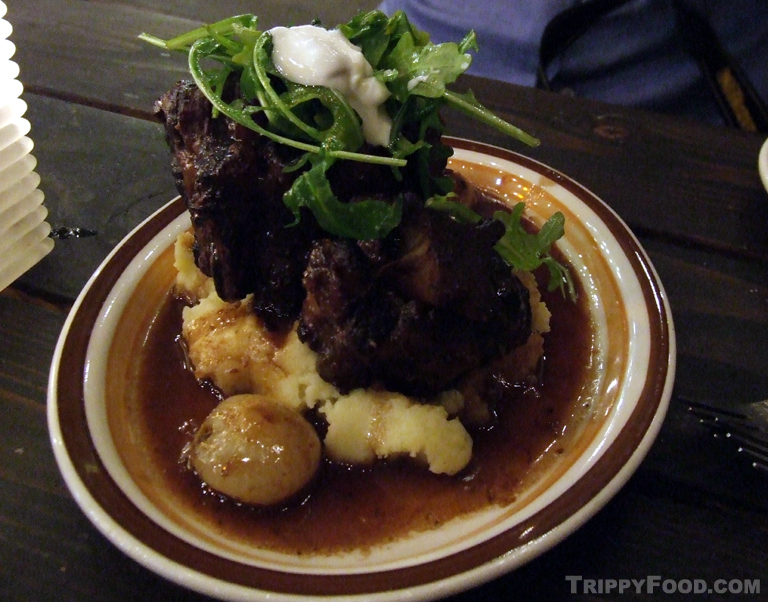 The oxtail osso buco that we went wild over at the pre-opener is obviously a dish that requires considerable preparation, so we decided to see if it was consistently outstanding and I am pleased to report that we were not disappointed, once again leaving nothing but bare vertebrae on the plate. 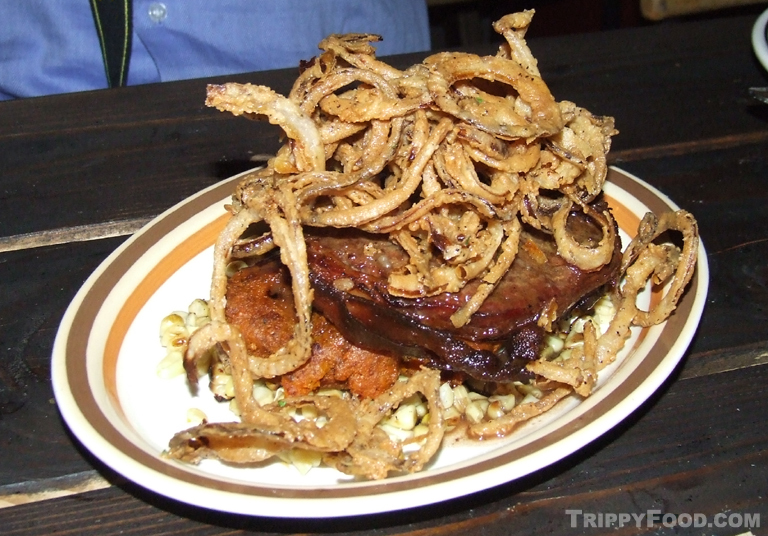 This entry was posted in Trippy Food (Tasty flora and fauna), USA and tagged April, asparagus, b read pudding, bacon, banh mi, barbacoa, boar, British, bubble and squeak, CA, California, chef, Chef Jesse, corndog, Domaine de Canton, duck, Easter, Eddie Lin, fried egg, gastropub, ginger, ginger beer, hangar steak, Kings Row, liqueur, meatloaf, Merguez, osso buco, oxtail, Pabst Blue Ribbon, Pasadena, PBR, potatoes, root beer, salmon, Sheppard's Stack, Sunday, Sunday brunch, tacos, Thomas Jesse, veal, Vietnamese. Bookmark the permalink. The dishes look really mouth watering; I can smell it from here… Do you have a recipe for the “bubble and squeak”? If you do, please post it here. Thank you! I wouldn’t have a recipe, as King Row does their own unique take on the British side dish. I’m sure you can find one online, but I doubt it would taste anything close to this. If you’re in the area, I’d be willing to bet Chef Jesse would share how he made it – good luck!